Have you ever thought of redoing your kitchen shelving with an open design style? Is it time to ditch those cupboards to give your kitchen a unique contemporary style like you’ve seen in home magazines? Progressive Builders is here to help you design the kitchen of dreams. Whether you want a traditional style or a contemporary open approach, we’ll get you pointed in the right direction. When it comes to an open shelving design, there are certain tips you should follow for the best possible results. Let’s take a look at a few you’ll want to know. If there’s already too much clutter in an existing kitchen, it’s hard to imagine what a fresh approach could look like. Before you can plan the open shelving look you want, you’ll need to take everything off the shelves and start with an empty canvas. Then you can start visualizing your design, one shelf at a time. Once you have your shelves laid out, it’s time to start putting items up. Think about what will look nice (pretty labels, interesting decorative items, etc.) and start arranging your shelves with an aesthetic presentation. You no longer have cupboard doors hiding everything, so you want your shelves and the items on them to look great. Also think about the color combinations and how those will look when certain items are put together on the same or neighboring shelves. Put purely decorative items and pieces you won’t use as often on upper shelves. Items you use most (plates, bowls, cups, cooking utensils, etc.) should go on the lower, more convenient shelves. With an open shelf look, less is always more. Avoid a cluttered presentation by not putting everything you own up on the shelves. Edit what you put up to preserve the open feel. Focus on one or two materials in your shelf design. Don’t go crazy with a bunch of different materials that may clash or make things look busy. Avoid putting your heaviest items on the top shelves. This is unsafe and also will make it difficult if you ever have to take them down or move things around. If something ever does fall from a top shelf, you don’t want it to be something very heavy and bulky. If you live on the West Coast where earthquakes are common, don’t put a lot of breakable items (especially glass) on the shelves. It’s a recipe for disaster. The same is true if you live near an airport or train tracks, or anywhere else that might be a little shaky from time to time. One of the biggest challenges with open shelving is that you have to dust and clean them constantly. If you want your kitchen shelves to look nice and your tools ready for food preparation and presentation, you have to keep the surfaces clean. 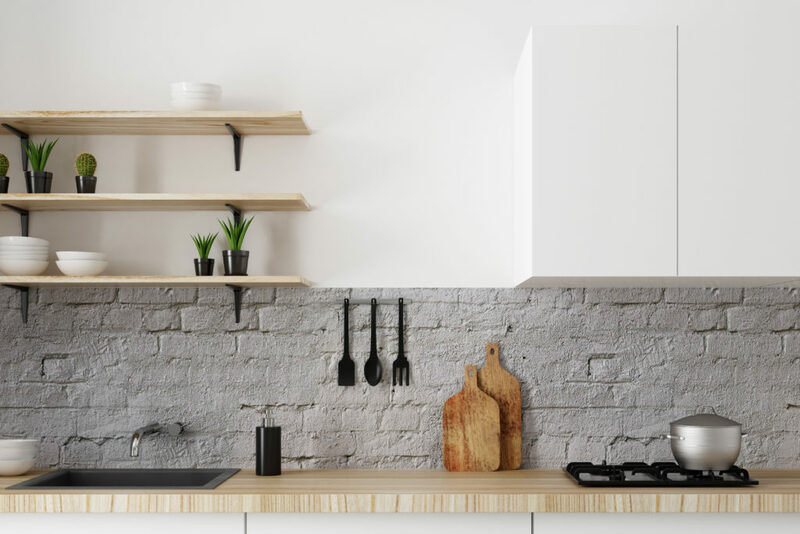 These are just a few of the helpful dos and don’ts to follow when it comes to designing, decorating and maintaining and open shelf look for your kitchen. To learn more about custom kitchen and bathroom designs and custom construction services from Progressive Builders, contact us today.